In a skillet or medium sauce pan, heat half and half over medium-high heat until you see bubbles around the edges (but not boiling). Stir in half of the American cheese and half of the fontina cheese; stir until melted. Stir in remaining cheese until all cheese is melted. Add chilis and taco seasoning; stir until combined. Serve warm with cilantro and extra chilis for garnish. 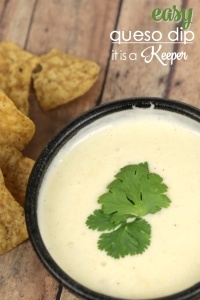 Queso dip can be stored in the refrigerator for up to 4 days. To reheat, add 2 tablespoons of half and half and microwave on high for 30 second increments until fully melted.